The software aims at making complex data recovery a simple procedure for both home users and professionals. 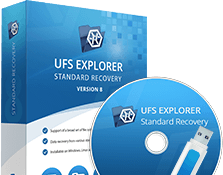 UFS Explorer Standard Recovery is a data recovery solution for most widespread data loss cases which easily retrieves lost and deleted data from various storages. 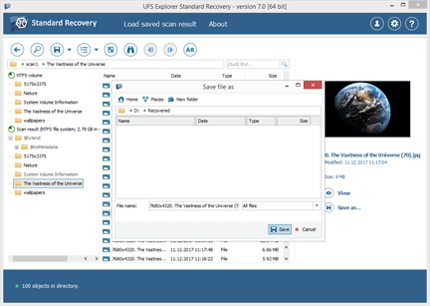 Thanks to the advanced techniques applied in UFS Explorer Standard Recovery, the software is able to thoroughly search the device for lost and deleted files and recover them with maximum efficiency. The application works in a safe read-only mode without making any modifications to the affected storage. Before the start of a recovery procedure, the software can evaluate the approximate condition of the data available on the partition. The program also provides means for automatic detection of lost partitions of the storage and tools for manual definition of partitions. Additional tools allow assessing the condition of the file system and its readability. The software offers a full-featured hexadecimal viewer allowing users to find and analyze data on the storage. Having found your files, the program allows you to easily save them to another safe location. The software is adjusted to work with file systems on disk images, virtual disks, etc. without the need for prior scanning. 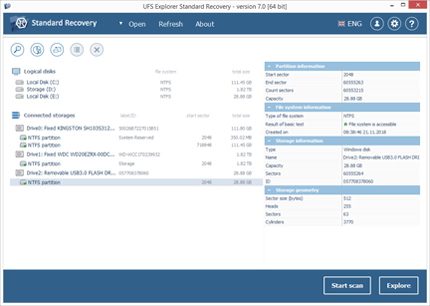 UFS Explorer Standard Recovery with its user-friendly interface offers clear step-by-step guidance through a set of sophisticated data recovery tools of the program simplifying complex operations and conducting them with just several mouse clicks. The software is released in several installation options and can be installed on three most common operating systems. The software can be installed on Microsoft Windows, Apple macOS and Linux. The software works with file systems of Windows, macOS, Linux and BSD/Solaris. Automatic detection and assembling of 'spanned' volumes. 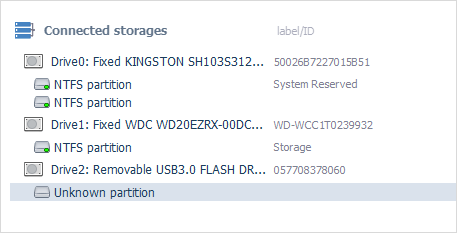 Other complex storage types are not supported. The software is capable of working with a wide range of partition allocation schemes and storage technologies. 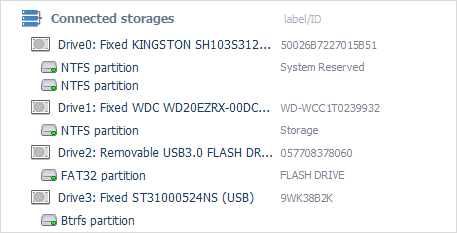 Drobo volumes, HP EVA, HP LeftHand, Symphony SAN, etc. The application allows working with disk images and virtual disks. The application has been expanded through a set of additional tools and features. System requirements – supported OS, 1 GB of RAM, 20 MB of free space. Trial version limitations – there are file size and the Save function limitations in the trial version. The software will copy files with the size below 256 KB. To install the program, download the installation file. Make sure that your computer meets the minimum technical requirements before running the file. If installation does not start automatically, browse the Downloads folder for the program setup file, the name of which usually contains the name of the software, e.g. ufsxsci.exe. Open the file with Administrator privileges or enter the administrator password, in case you are an ordinary user of PC. Start the installation by following the prompts. 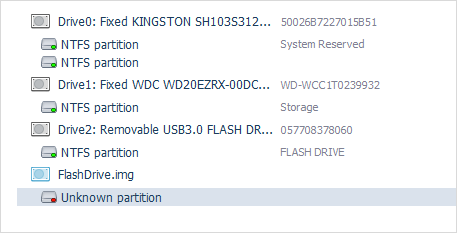 NEVER download or install the software on the storage (drive, flash drive, RAID, etc.) you have lost data from. This can result in permanent data loss leaving no chances for its recovery. 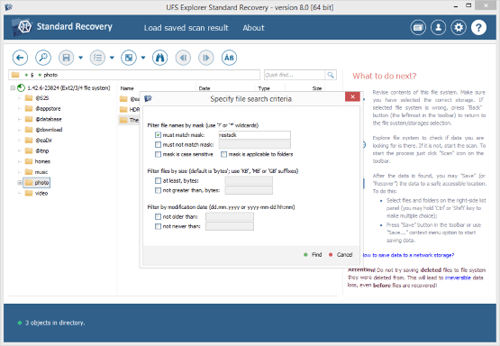 In case of data loss from a system partition, it is highly recommended to shut down the system and consider using UFS Explorer Emergency Recovery CD. After launching the program, you will see the navigation tree on the left side of the tab where all detected storages will be shown together with partitions, disk images and complex storages (RAID). You can either choose the needed storage from this top-level structure or use the Open button on the upper panel. In case you don’t see the needed storage, press the Refresh button to reset the tree of the attached storages. Right-click the storage to browse through available intact files and folders. Left-click the storage and press the Start scan button to proceed to data recovery. To find lost and deleted files, the application will scan the chosen storage, which may take a while, depending on the amount of data stored and working speed. The scan settings include the option of choosing a file system or several file systems in which the lost data was created and enabling the IntelliRAW technology for data recovery by known content. When everything is set, press Start scan. For more convenience, the scanning process can be paused so that the intermediate results could be evaluated. When the scan is over, it's strongly recommended to save the scan result project for further work. The scan results include all found files and folders that can be recovered. The simple interface allows users to preview the recovered files before saving them to make sure that the results are satisfying their needs. Users can browse and save the needed recovered files just like in an original file system. NEVER save the recovered files to the storage they were recovered from. The file data (contents) is still read from the source drive; this means the software may overwrite file contents making recovery impossible. Use another storage to save the recovered data. 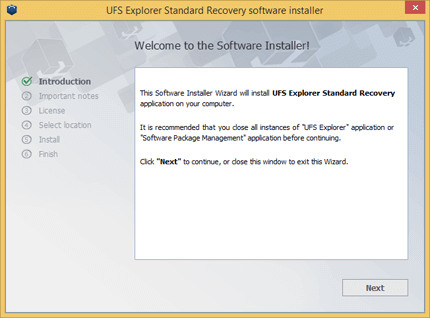 All UFS Explorer products are offered as shareware. Therefore, one can try out the program before purchasing a license. It’s strongly recommended to use the trial version and evaluate the results of recovery before ordering a license. 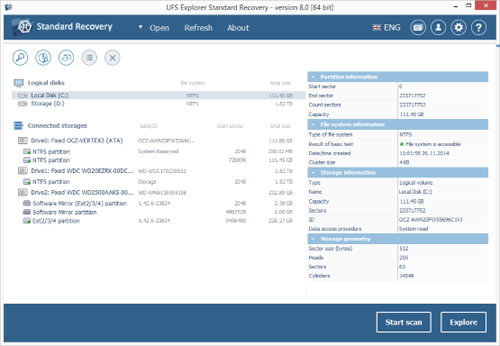 UFS Explorer Standard Recovery supports data recovery from a wide range of file systems applied in Windows (FAT/FAT32/exFAT and NTFS), macOS (APFS, HFS+), Linux (XFS, Ext2, Ext3, Ext4, Linux JFS, ReiserFS, UFS/UFS2, big-endian UFS, Btrfs) and BSD/Solaris (UFS, simple ZFS volumes). An additional option of pre-recovery file system testing allows users to reconstruct a corrupted file system before starting the data recovery procedure. 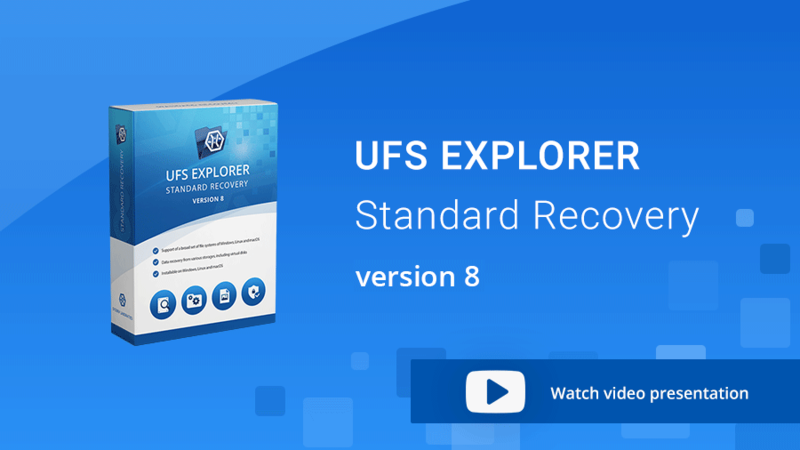 UFS Explorer Standard Recovery is enhanced with helpful options of previewing the found files of most common formats, including images, PDF documents and text documents, and sorting them by date, size and name. With the IntelliRAW technology enabled, the software provides the found files in separate file format-specific folders for more convenience. Get access to files or cope with data loss common storage media: hard disk drives, USB sticks, memory cards, etc. The utility effectively works with various linear storage devices formatted in Windows, Linux and macOS, including internal as well as external hard disk drives, USB flash drives, memory cards and many others, thus serving as an essential data recovery tool for handling most typical cases of data loss, like accidental deletion of files, storage formatting, malware attack, hardware or software malfunction, etc. 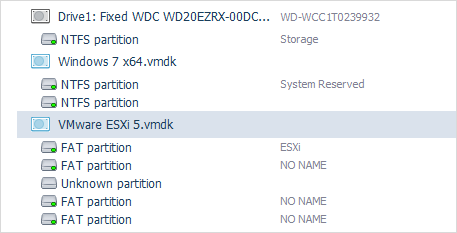 Open or recover data stored in virtual machines: VMware, Hyper-V, VirtualBox, etc. 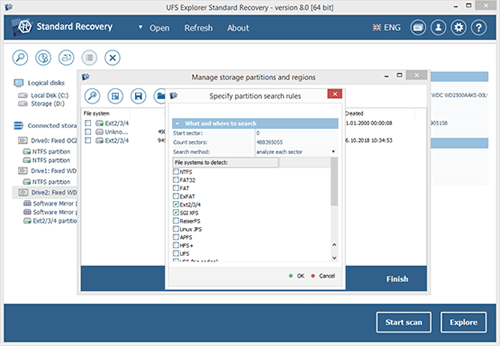 UFS Explorer Standard Recovery effectively deals with disk images and virtual disks created by major virtualization software, like VMware, Microsoft Hyper-V, VirtualBox, QEMU, XEN, etc. and successfully copes with data recovery from such storages as though they were ordinary physical devices. A set of tools integrated in the software allow effectively solving practically any case of logical data loss, including the most severe ones. The program will either simply read file system metadata or conduct its detailed analysis and predict the allocation of files based on the file system specifics, allocation of other files or file content analysis to produce the best possible data recovery result. 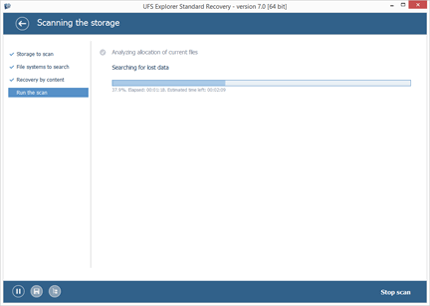 UFS Explorer Standard Recovery is capable of recovering data lost from an undetected partition. The program includes means for finding lost partitions or defining them manually before scanning the storage for lost and deleted files.